Before I even ran in my second Turkey Trot, 70 lbs after my first Trot one calendar year ago, I had an idea. The morning before Thursday's race, I went back to the official photos from that first Turkey Trot. I hadn't looked at the photos for some time, and looking at them before the race, I was met with a huge shock. I was so fat, I thought. I have a hard time thinking that it was only a year ago that I looked like that. It seems like it was five (or a million) years ago. 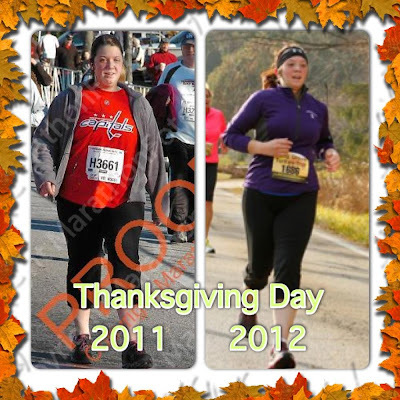 I knew I wanted to do a side-by-side "Before and After" with this year's Turkey Trot photos, since I knew it was going to be a dramatic difference. The photos from this year's Trot came out today. I can't wait for 2013's Turkey Trot. Runner's World posted a link on their Facebook page today that I just had to share. The Westin brand of hotels has announced a partnership with New Balance that gives guests the option to rent athletic apparel - including shoes - for a small fee during their stay at a Westin. It's called Gear Lending, and it's a great idea for busy travelers who don't have the room in a carry-on for workout clothes and shoes. The Westin's philosophy is "You're more likely to exercise if it's convenient," as shown in a video promo for the program on their website. It's spot-on - if you're away on business for just a few days and only have a small suitcase, it's a hassle to put some clunky running shoes in what is already a limited luggage space. And if you didn't bring your workout gear with you on a trip, you're probably not going to be doing any exercising. This is a great way to reach out to active customers and offer them a valuable service at a nominal fee. Since the service sounds pretty darn new, I would think that so far, Gear Lending is available at a few larger market hotels and will expand in the future. But I'd also be interested to know about the selection of gear they will have available. There are just a few clothing options for women listed on the website (one pair of capris, a sports bra, and a t-shirt) and one model of neutral-cushioned shoes. Hopefully they will make more options available in the future for pronators, or people who need a stability shoe, etc. However, this is a great start and an excellent concept. Have you tried Gear Lending at a Westin yet? Let me know in the comments - I'd be interested to hear about the experience. With the weather getting colder, I recently walked into the newly-built LA Fitness near my house to join. As I sat with the sales consultant who sold me my membership, I told her about my recent weight loss (at the time, 65 pounds in about 10 months). When another salesman came over to say hello, she told him how much weight I'd lost. "Wow," he said. "You're a real-life success story!" It was the first time I'd heard someone call me a success story. I'd never thought of myself that way, but I suppose now that I think about it, I am. And now I'm taking ownership of it. I wasn't always fat. I was a normal-sized, active child who was also a competitive figure skater. I stopped skating in high school, but even after dropping the skating, I was still a two-sport athlete. In the winter, I played on our girls' ice hockey team, and in the spring, I played on the badminton team. It was after high school that my weight issues began, particularly in that caloriefest known as college. I entered college wearing a size 6/8 - I left it a size 14. The "Freshman 15" is supposed to be proverbial, but for me, it was a reality. I kept packing it on during college, and after graduation, I went even further off the deep end. By 2009, two years after graduating college, I was a size 18 and weighed 230 lbs. I went on Jenny Craig in 2009, and by 2010, had successfully lost 55 lbs. But then, I plateaued. Hard. To make matters worse, I lost my job in 2011 and couldn't afford to order Jenny Craig anymore, and I subsequently lost all the forward progress I'd made. I know now what the problem was. Instead of "changing my lifestyle," I'd learned to eat what was given to me. I thought I'd been changing my lifestyle, but what I really needed to do to change my eating habits hadn't sunk in at all. I had merely been forcing myself to eat the Jenny Craig food, and purposefully attempted to deprive myself of the cheeseburgers and burritos that I really wanted to eat. Once Jenny Craig was out of the picture, all those deprivations were out the window. That coupled with unemployment meant I was sitting around all day eating those cheeseburgers I had so wanted the whole time I was on Jenny. I gained every pound back, and the size 18 jeans made a terrible reappearance. The job market was a tough go in DC, and after six months, I was forced to move back in with my parents in the Chicago area in November 2011. I continue to lament the fact that I can't walk anywhere in my small suburb, but on the other hand, it has kept me from wandering two blocks down the street to Chipotle and has put a lot of home-cooked (and calorie-controlled) meals on my plate instead. After I moved home, I started to lose weight. I'm not even entirely sure how it happened or why it happened, but I started to eat less and eat better food, snack less, and drink less. Fast food became a nauseating prospect, and full-fat cheese became Exorcist-level frightening. By June 2012, I'd lost 50 lbs by sheer diet changes alone. But I needed to do something more. I'd lost 50 lbs, yes, but I could see my momentum start to slow. I'd never been a big fan of exercise - I hated sweating and doing any sort of exercise that I deemed not fun (which was, well, most exercise). 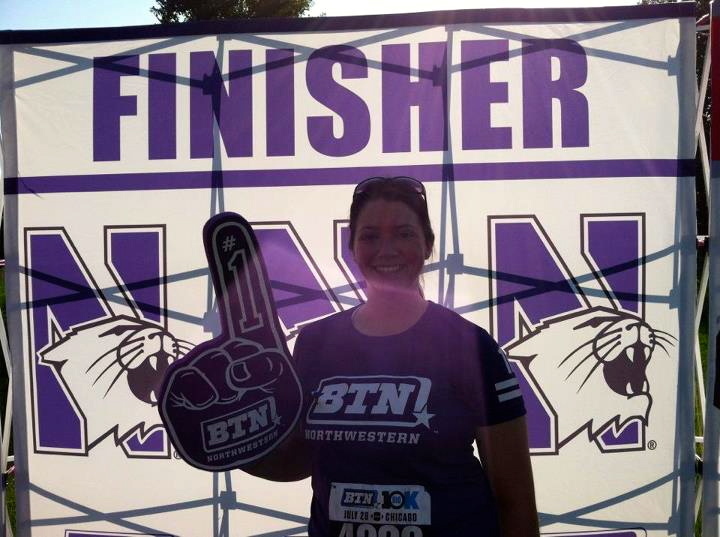 Yet in July, I registered for my second 5K. I was determined to jog most of it, and knocked 10 minutes off my previous time, a Turkey Trot in November 2011 that I walked. I don't know what happened exactly, but something in me switched on. Running was perhaps my most hated activity previously, and I could never find the motivation to follow through with it. But for some reason, I wanted more. I figured out what could make me exercise: competition. By nature, I'm a very competitive person, and I discovered that competition would give me the motivation to run. So I purchased a Couch to 5K app on my phone for the internal competition of constantly striving for a better pace, a better time, a harder run. I also bought the Zombies, Run! app, which provided the best external motivation possible: running from zombies. With the two apps, I started running almost every day. From August to November, I lost another 20 lbs, bringing my weight loss total to 70 lbs. In my second Turkey Trot, one year after a 230 lb walk, I completed a 29:48.7 5K, my first sub-30 race and a PR for sure. It's ridiculous to think about how far I've come in a year, and how much I believe I have really changed my lifestyle for good. I'm a comfortable size 10 (which I haven't been since early freshman year of college), in a size medium in shirts (which I haven't been since high school), and 160 lbs. But I still have more to go. My goal is to lose 20 more pounds, to put me at a weight that is considered within the normal range for my height. I'd love to fit back into a size 6, but even an 8 would make me happy (though I do already have some size 8 pants that fit me). I'm thinner and much fitter than I've been in almost 10 years, and I feel like I'm in the best shape of my life, physically and emotionally. So why start this blog? Whenever I got excited about a new PR or a great workout, I feel like I was bugging my Twitter followers about it (most of them follow me for hockey, and probably don't really care about how my run went today). So for me, this is a place for chronicling my progress, bragging about my latest pace, lamenting hangups, but also reviewing healthy foods and recipes, athletic apparel, local races, and more. Since I began this journey, I've had people tell me I'm an inspiration. It's a huge compliment, and something I'm still not totally comfortable agreeing with. But if you find inspiration from this blog, I'm glad. I just want to share my story in the hopes that others can believe they can do what I did. Because it's possible. You can do it. You can run a 5K; you can lose 5, 10, 50 pounds; you can learn to love grilled chicken salads so much more than Five Guys cheeseburgers. The comment box is always open and I'd love suggestions on new things to try. Thanks for visiting and joining me on the journey.